NYCFC Captain David Villa and Manchester City Manager Pep Guardiola. Courtesy NYCFC/Manchester City. 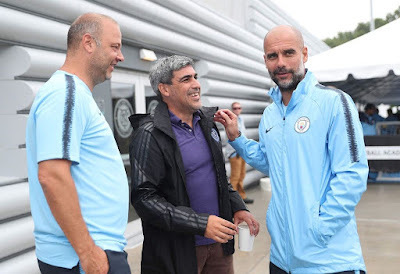 New York City Football Club got the chance to have a training session with their parent club, Manchester City FC on Monday afternoon at NYCFC’s elite First Team training facility, Etihad City Football Academy NY. NYCFC Head Coach Domènec Torrent reunited with his former boss, Manchester City Manager Pep Guardiola, for the first time since leaving the current Premier League champions in June to coach NYCFC. 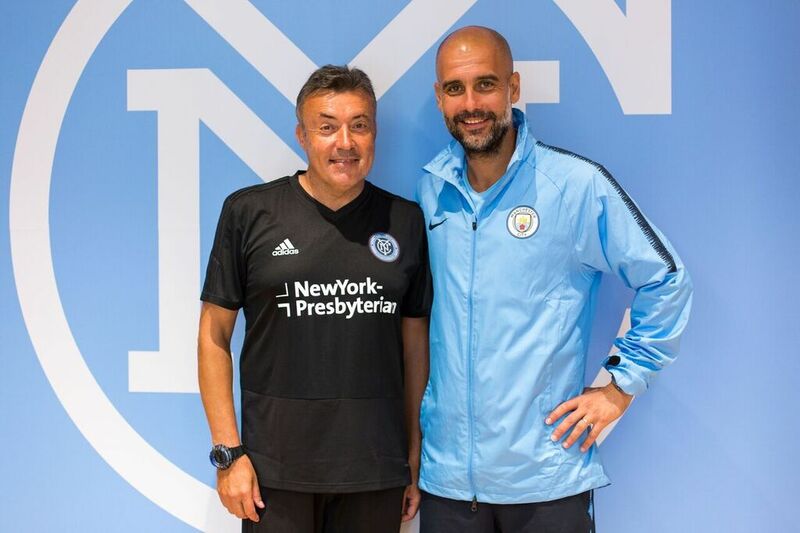 NYCFC Head Coach Domenec Torrent with Manchester City Manager Pep Guardiola. Courtesy NYCFC/Manchester City. 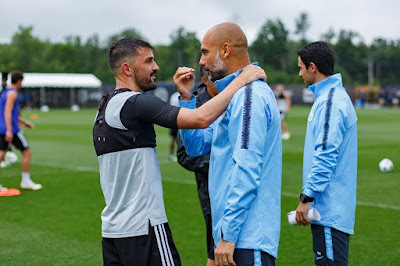 Guardiola also reunited with NYCFC captain David Villa, who he coached at Barcelona and where they won a UEFA Champions League title together. Manchester City faces off against Liverpool FC at MetLife Stadium on Wednesday, July 25 as part of their 2018 pre-season U.S. tour. NYCFC hits the road this week to take on Orlando City SC on Thursday night at 8:00 pm, and the Seattle Sounders FC on Sunday, July 29. NYCFC and Manchester City take a picture after the training session. Courtesy NYCFC/Manchester City. 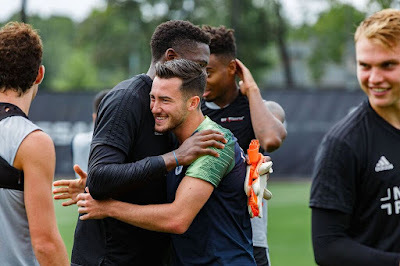 Manchester City's Jack Harrison, who spent a couple years with NYCFC, catches up with his former teammates. Courtesy NYCFC/Manchester City. NYCFC Sporting Director Claudio Reyna catches up with Manchester City Manager Pep Guardiola. Courtesy NYCFC/Manchester City.